March 8, 2011; LONDON - AC/DC Live At River Plate, a definitive live concert DVD documenting AC/DC's massive Black Ice World Tour, will be available for purchase on Monday 9 May 2011. Shot in December of 2009, AC/DC Live At River Plate marks AC/DC's triumphant return to Buenos Aires where nearly 200,000 fans, and 3 sold-out shows, welcomed the band back after a 13 year absence from Argentina. This stunning live footage of AC/DC underscores what Argentina's Pagina 12 newspaperreported by saying "no one is on the same level when it comes to pure and clear Rock 'n Roll." Directed by David Mallet and produced by Rocky Oldham, AC/DC Live At River Plate was shot with 32 cameras entirely in HD. AC/DC Live At River Plate features 19 songs (110 minutes) as well as 'behind the scenes' footage of this massive production coming together among the excitement of anxious fans (see below for full track listing). AC/DC Live At River Plate will be available on DVD, Blu-Ray and Ltd Edition collector's edition with exclusive t-shirt. Additionally the DVD contains a bonus feature titled "The Fan, The Roadie, The Guitar Tech & The Meat," features interviews with AC/DC, their crew and fans among the excitement of the shows and the city of Buenos Aires. 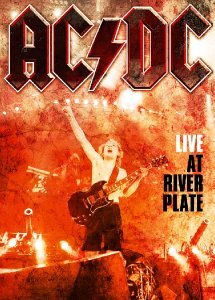 AC/DC Live At River Plate is available for pre-order at www.ACDC.com and Amazon. AC/DC Live At River Plate captures the intensity and power of the band's critically acclaimed world tour in support of their most recent album Black Ice, which debuted at #1 in 31 countries. The Black Ice World tour took AC/DC on a 20 month trek around the globe playing to over 5 million fans in 108 cities in over 28 countries. The Black Ice World Tour earned AC/DC a Pollstar Award for Major Tour of the Year in 2010.